Madhya Pradesh Chief Minister Shivraj Singh Chouhan on Tuesday announced Rs 10 lakh for the family of the policeman allegedly killed by SIMI activists who escaped from the Bhopal Central Jail. BHOPAL: Madhya Pradesh Chief Minister Shivraj Singh Chouhan on Tuesday announced Rs 10 lakh for the family of the policeman allegedly killed by SIMI activists who escaped from the Bhopal Central Jail. 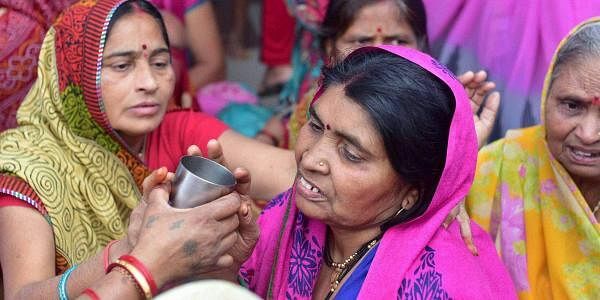 After attending the funeral of Ramashankar Yadav, who was posted in the prison, Chouhan also said that Rs 5 lakh would be given for his daughter's marriage. Reacting to allegations that the alleged shootout of Monday which killed the eight SIMI activists may be fake, Chouhan said the "matter should not be politicised". "Some people are doing vote bank politics on this matter which is highly condemnable. One must refrain from such things," Chouhan told the media on the sidelines of Yadav's funeral. "Some political leaders cannot recognize the martyrdom of our jawans. It is painful," he added. "They cannot see Ramashankar's sacrifice." Chouhan said if need be the government would spend more on the wedding of Yadav's daughter that was scheduled to be held on December 9.